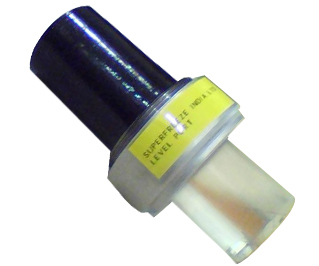 Superfreeze level port is a simple device to see actual levels in refrigeration system. It has reflex glass. When liquid is present behind glass, it appears dark. When vapor is present, it is light. The neck is provided long for ease of welding and insulation clearance for low temperature service. To see level clearly in frosting condition, Frost shield may be provided. Superfreeze level port is suitable for ammonia, R22, R134a and other refrigerants. It can be installed on receivers, level columns, accumulators, intercoolers, suction lines, oil lines and liquid lines.